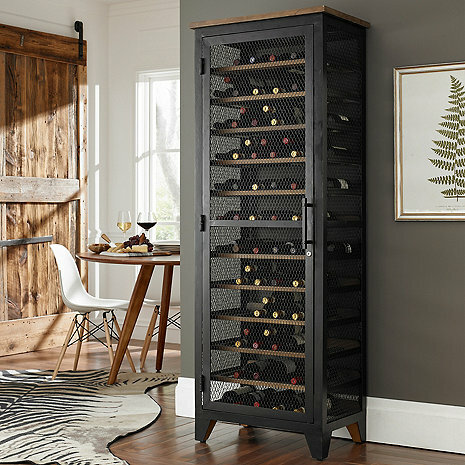 Proudly showcase your wine collection. The black mesh, metal frame with reclaimed wood combination is a stylish update to the classic wine jail. The upright locker design holds up to 120 bottles and is versatile enough to fit perfectly anywhere in your home. Lock and key ensures that ‘jail’ is a safe and secure place for your wine. Please note: No two units are exactly the same. Reclaimed wood may have some small imperfections and holes from the original nails. What colors does this come in - what is the color of the unit? Can this unit hold magnum bottles? This cabinet is stylish and fits well in our mostly modern home. The size is perfect for us. We are not collectors and we love to drink wine and keep a few extra bottles of our favorites on hand. The cabinet is well made and came completely assembled and in a sturdy cargo box. The delivery service was superb. I highly recommend this wine locker!